We provide here the visual presentation of latest pallet wood achievements that help to enhance both your interest in pallets and of course your creative sense! We are again here to amaze your senses with mind-blowing recent pallet projects which we have showcased here as smart DIY pallet ideas, checkout this whole short list of pallet ideas and you will feel yourself inspired at the end! Elevate pallets on custom metallic or wooden legs and start using them as stunning coffee tables! Take the pallets into pieces and use them to build smaller wooden boxes, tier these boxes up in a vertical self-standing frame for bewitching multi-tiered garden planters! Such a tiered planters may also come in handy as vege or fruit organizers in your kitchen! 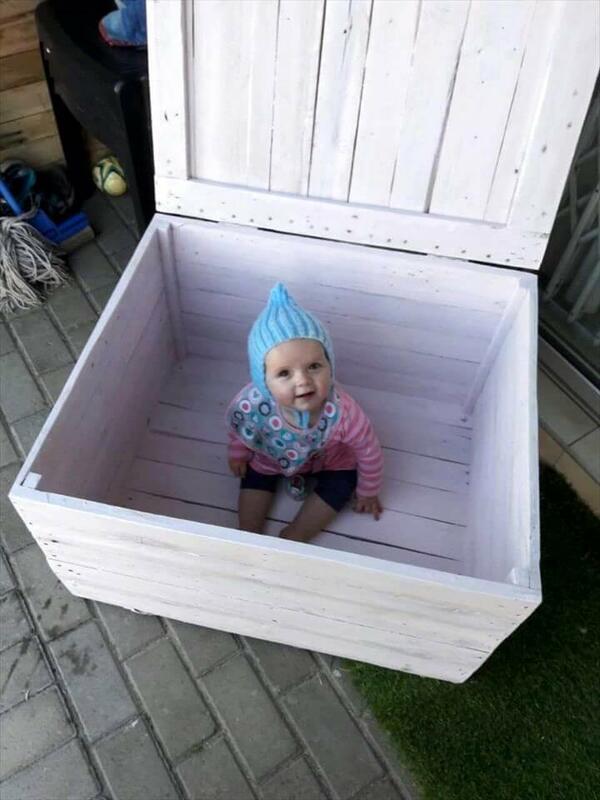 Again build custom boxes with pallets and finish them with custom lids for kids toys chest out of them or just use them as they are as storage boxes! 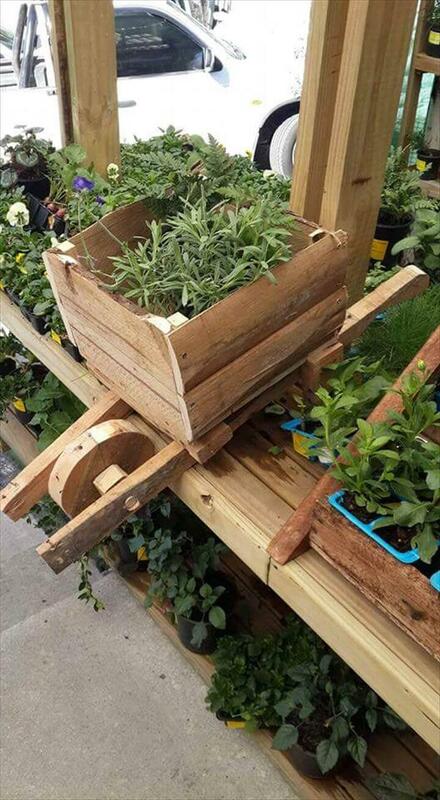 Raise the same pallet boxes on a wheelbarrow frame (made it also with pallets) and get amusing garden wheelbarrow planters that would raise the garden decors to peak! 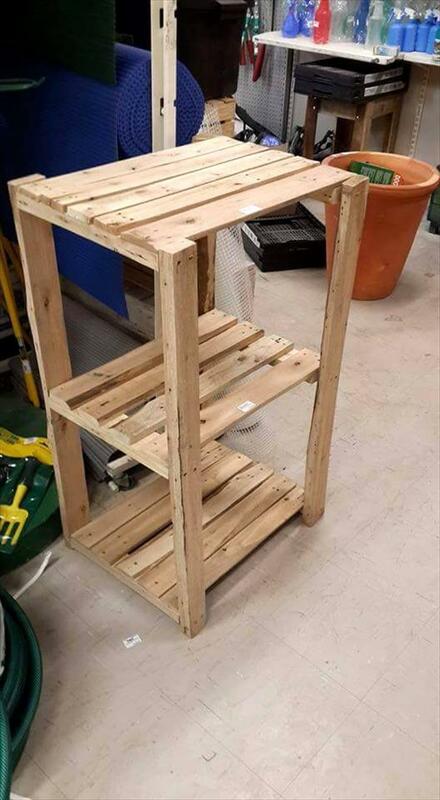 Go handmade with single straight pallets slats for making garden gates and also custom furniture items like kitchen carts and storage-friendly coffee tables! In this list you will find all the practical samples of ideas discussed above! Go for a roundup now!!! 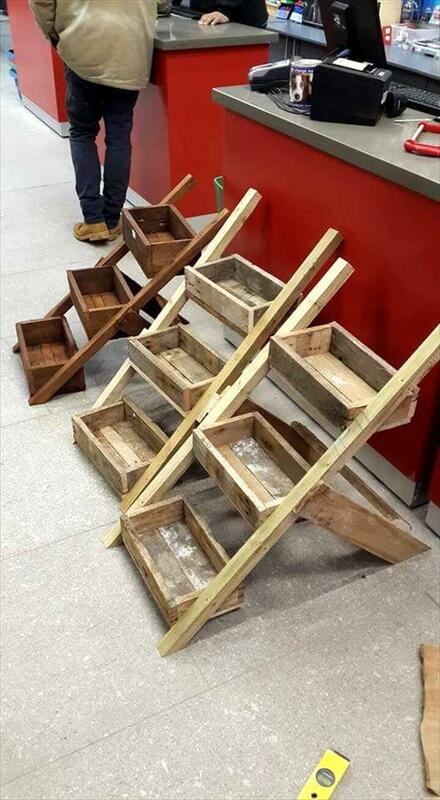 Build simple boxes with pallets and just tier them up in a vertical frame! 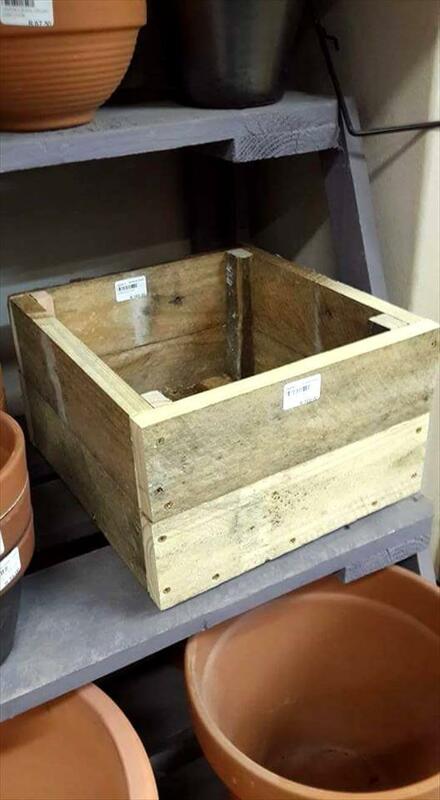 Use the hanging boxes for potting purposes and hence you will get a multi-tier box planter for your garden! Here is how it will look like after growing your favorite herbs of flowers! One can also use it as an organizer in home or in kitchen! 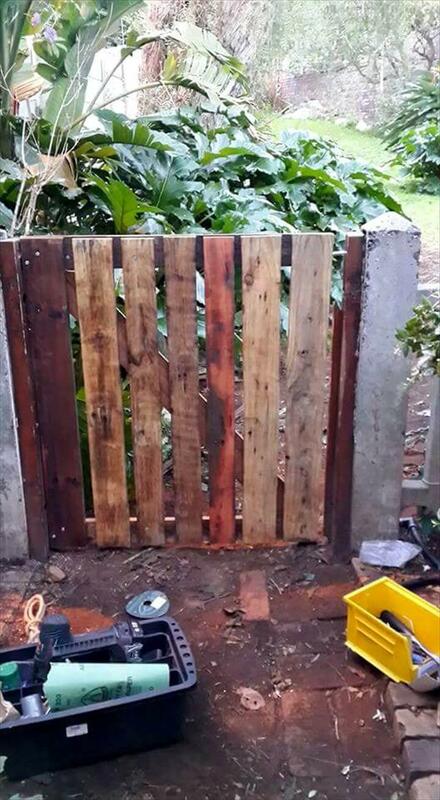 This one of the most praise-worthy pallet crafts that help the boost the visual and decors of your garden! A precious wheelbarrow planter! 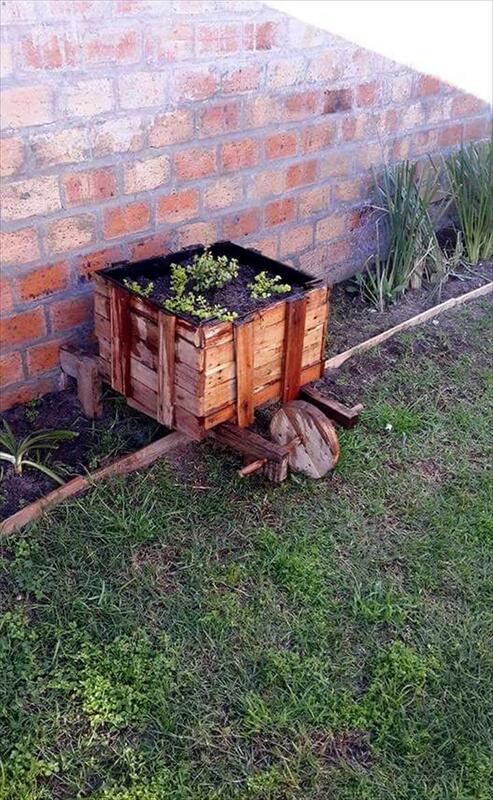 Here is another smart one, comes with a bigger planter box and is a bulky one! Here is how you can improve your garden and green outdoor spaces with pallets! 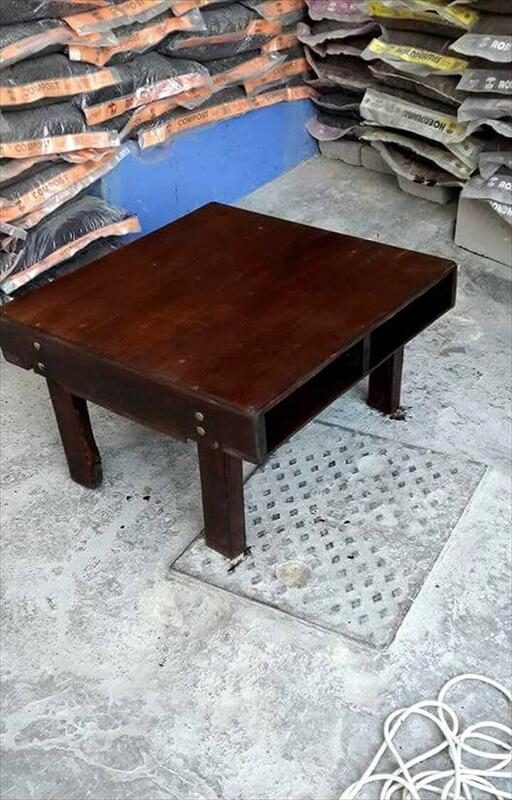 While organizing a living room, this would be your very first desire, a hand-built wooden choco coffee table! All composed of pallets! See the clever arrangements and filling of pallet slats, resulting into a beautiful wooden coffee table that also offers inside storage space to hide your journals and to store other living room supports! Finely built wooden chest, put together the slats for building a stylish box and then just install a hinged lid to it for a kids toy chest out of it! Paint the entire chest in any paint color and enjoy a more eye-popping appearance of it! 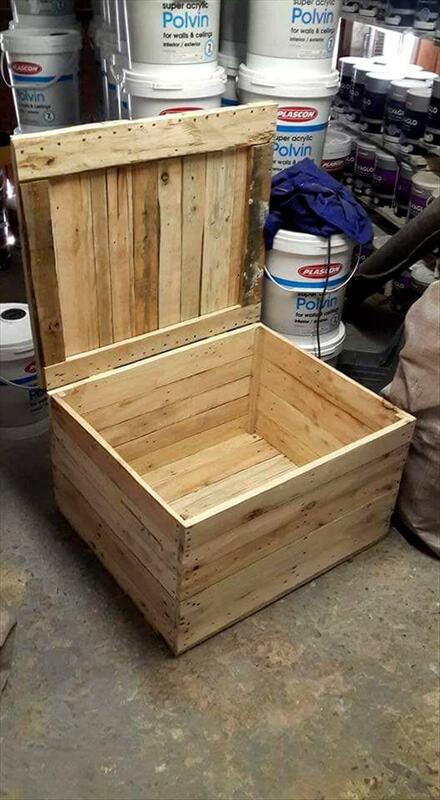 Build simple pallet boxes to use as wooden garden pots and also as storage boxes in home! 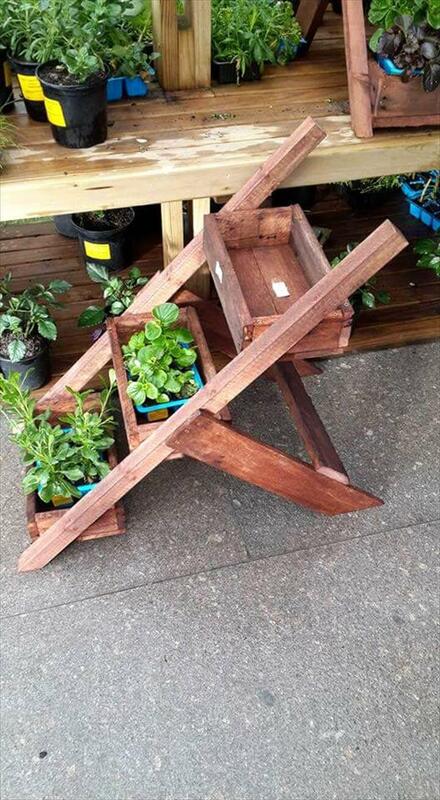 Reclaim pallet leftovers to do so! Install a frame by going with vertical and horizontal alignments of pallet slats! Now use this hand-built wooden frame as a wooden gate to boost the security of any outdoor or indoor space! Here is a beautiful high top table with custom built-in shelves, raise it on wheels to use as a kitchen cart or coffee station! Otherwise, it would work great as a side table! 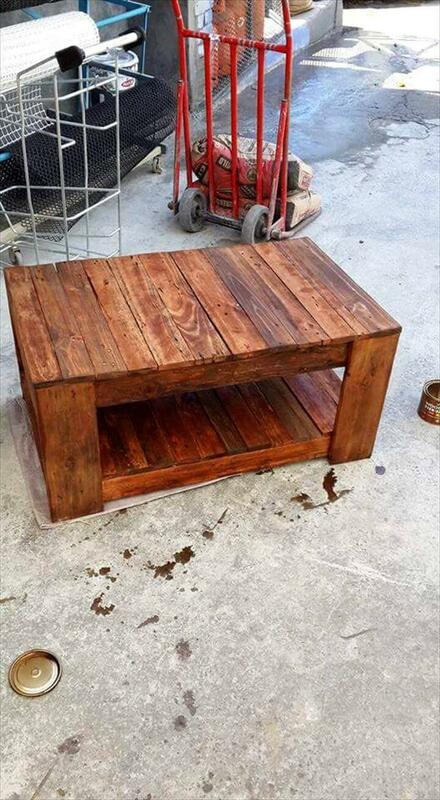 Reclaimed Pallet Deck Flooring - Pallet Outdoor! !